From a young age, I was told I had an odd voice. It was a little too low for a girl and I tended to whisper a lot. I blame the whispering on the house I grew up in, which was big and echoey. If you didn’t want mom to hear you talking about inane things on the phone, whispering was a necessity. I didn’t realize my talk-in-a-low-whisper voice was useful until I started doing interviews for market research and editorial. Somehow my quiet voice inspired confidence in others, and I found people confided in me easily. And I was asked to do more interviews … and the process repeated itself until I found that I liked it. And over time I become better at it. Through hundreds of interviews, I’ve learned a lot about how to diffuse tension, set a good conversational tempo, and design probing questions, among other things. 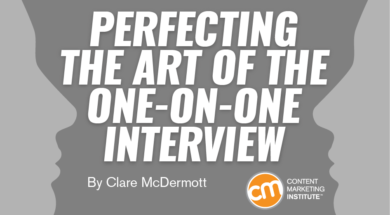 And interviewing is an absolutely key skill for content marketers. Editorial – Be it for your blog, podcast, vlog, book, or some other format, interviews are an excellent way to source original insights. Customers: Running low on ideas to feed the content beast? Customer interviews can offer amazing fodder. Stephen Dupont wrote an amazing article for CCO magazine about how to do this. When I was editing Chief Content Officer magazine, we needed to interview Alexis Ohanian, founder of Reddit. I chose Robert Rose, CMI chief strategy advisor, to handle it because I knew he was a big user of Reddit and would be able to ask probing questions I could not. (I’ve since become an obsessive Redditor, but that’s for another day.) Similarly, if you’re interviewing a CEO for a survey, ensure that the person conducting the interview can sound credible and knowledgeable. No, you’re not going to find another CEO to interview him/her, but you should choose an interviewer who has enough subject matter expertise that your interview subject can loosen up and give insightful answers. Any interviewer fears losing a recording and having to repeat an interview. It’s only happened to me once (luckily, I was also transcribing in real time, which I’ll tell you later is usually a no-no.) For live interviews, I typically use a separate device (and for high-value interviews, I set my iPhone app to record in parallel). For phone interviews I use the Voice Memos app on my iPhone (or via Skype, I rely on Call Recorder, a Skype plug-in). I don’t recommend asking someone to join the call as a transcriber because an observer can ruin the environment that a one-on-one conversation provides. Always do your research pre-interview. It’s critical to find out about your subject’s background, area of work, publications, and accomplishments. I even look online for previous recordings of interviews to see how they behave during interviews. A year ago, I interviewed Fran Lebowitz and was glad that I had listened to some of her other interviews. She has a way of intellectually sparring with people, and my preparation meant I wasn’t taken aback when she did it with me. I generally prepare questions for my interviewees, but I try not to overprepare. Overpreparing tends to take you out of the moment and make you deaf to possible areas to probe that come up during the interview. Generally, I prepare an outline of subjects I want to learn about, as well as ideas of how to pick at things that we may touch on, but as many as half of my questions (sometimes more) do not follow my plan. TIP: Questions can serve many purposes. Your first question is a way of warming up your interviewee. It also serves to tee up your own expertise, so that your interviewer feels comfortable sharing more complex or advanced ideas as the interview progresses. TIP: You may ask questions that help uncover an individual’s expertise or insight, yet other questions may be designed to uncover someone’s personality or quirks. Make sure you get a well-rounded picture to make the interview more interesting. I strongly resist sharing questions in advance – and if someone asks for my questions, I give the bare bones. First, sharing questions means your interviewee may overprepare and sound wooden during an interview. It also puts the locus of control in the interviewee’s court, meaning the person is less likely to share something unplanned or personal. Finally, sharing your plan makes it more difficult to deviate from it (i.e., “That wasn’t on my list of questions!”). In the case of celebrity interviews, it’s easy to give in to the “I’m such a big fan” impulse. Don’t. Famous people hear this all day long and it’s awkward. Unless you have something meaningful to say about your celebrity crush – for example, a movie by XYZ-celebrity changed the course of your life – don’t say a thing. Treat them like professionals. Ask your subjects if they have questions about the audience they are speaking to in the interview or the way in which you plan to use the interview. It’s an icebreaker, and often the audience information is useful in the way they craft their responses. If you’re recording the interview (and you should be), always ask permission to record and explain clearly that you are using it for transcription purposes only. And never share that transcription with anyone except your transcriber. Your first question should be a bit of a softball – one with an easy answer that doesn’t tread on uncomfortable subjects. Just as you wouldn’t ask a personal question at the outset of a first date, so too should you warm up the interviewee before asking the tough questions. BONUS TIP: At times I interview people about topics I don’t understand well even though the intended audience does. I don’t want the interviewee dumbing down their answers so I tell my subjects to respond as if they are speaking to a more knowledgeable colleague rather than a relative beginner. Successful interviews often have a nice tempo. There’s an art to probing deeper and building confidence. This isn’t something you can always control, but designing your questions to follow this type of progression – from easy and comfortable, to probing and more authentic – can help you build rapport and uncover more information. Don’t be afraid to take detours during your interview. By the same token, if one of those detours isn’t bearing fruit, find your way back to your original questions. Mid-stream course corrections are done easily if you’re not transcribing or taking notes as you interview, which should be another reason to always use a recording device. Over the years I’ve come up with a handful of questions that I consider weird and wonderful – weird because they are unexpected and wonderful because in that moment of unexpectedness, sometimes my subject reveals a lot. That question has produced some awkward moments, but it has also delivered some unbelievably powerful and personal responses. Don’t be afraid to throw in a weird question from time to time … sometimes making someone feel just a little unsettled or unprepared is a good thing. Silence is a powerful tool in the interviewer arsenal. Do not feel awkward about silence. Let it sit. Sometimes your interviewee is formulating a response and needs a bit of time to let it gel. Sometimes the person is weighing whether he or she feels comfortable sharing a truth. Sitting patiently through silence increases your chances of getting an interesting response. If you build enough warmth and camaraderie in an interview, once in a while an interviewee will share something extremely personal and even painful. If someone shares a very personal detail with me, I never use it without explicit permission. One celebrity I interviewed told me something so personal and poignant that I wondered if he regretted sharing it. He did give us permission to print those words, but I needed to know he was comfortable before doing so. It’s about treating your subject as a human, not a celebrity. I have heard interviews in which the interviewer feels a need to position him/herself as a peer, and so launches into his or her views on the topic. (I stopped listening to Alec Baldwin’s podcast, Here’s the Thing, because he has this problem in spades.) Do not do this. Yes, you may insert an idea or comment to warm up the conversation or direct flow, but overall yours must be a supporting role. Wrap up your interview by clearly explaining the next steps, such as whether they will review the final interview and/or layout and when you expect it to go live. Don’t forget to ping them before you hit “publish” so they can share the interview with their networks. BONUS TIP: From time to time, I’m asked to conduct interviews on stage, which I consider a totally different beast than the situations I’ve outlined. There’s something about getting out in front of thousands of people that can zap the candor and spontaneity out of an interview. One thing that helps is to take time prior to the stage interview to talk and build rapport. Having a baseline of a relationship – even one based on a 15-minute chat – can help warm up the tenor of the interview. Observe the interviews from the main stage at Content Marketing World this September – and learn from hundreds of presenters about all facets of content marketing. Register today.